Adventures with Van Gogh is a weekly blog by Martin Bailey, our long-standing correspondent and expert on the artist. Published every Friday, his stories will range from newsy items about this most intriguing artist to scholarly pieces based on his own meticulous investigations and discoveries. The sitter in Van Gogh’s Portrait of a Gardener, now owned by Rome’s Galleria Nazionale d’Arte Moderna e Contemporanea, can finally be named. He is identified in a note recording the memories of an orderly who worked in 1889-90 at the asylum of Saint-Paul-de-Mausole, where the artist was a patient. 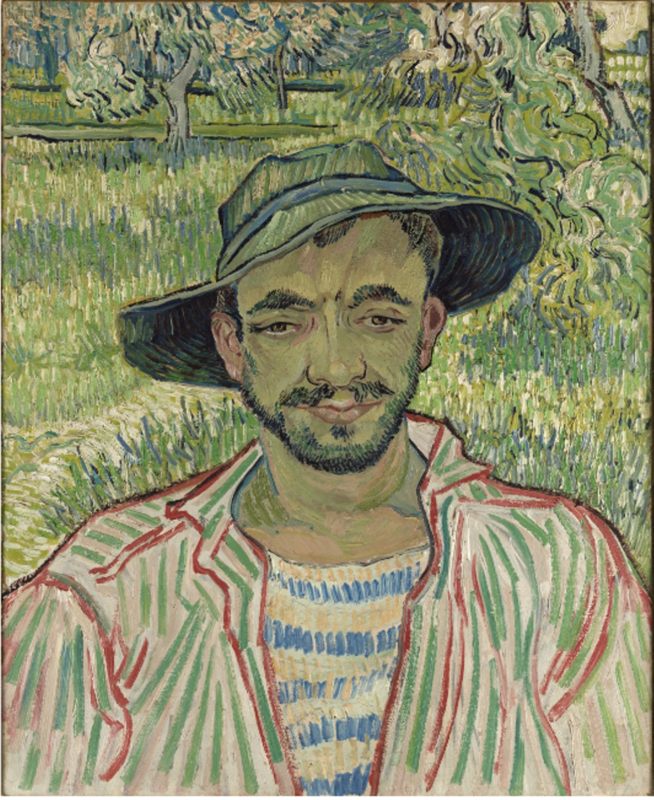 Van Gogh’s portrait shows a lively young man with a friendly expression, dressed in bright clothing and standing confidently in a verdant glade. The setting is the garden of the asylum, with the rear wall that protected the patients. The portrait, the finest painted by Van Gogh at the asylum, has always been something of a mystery. The sitter was recorded as “le jardinier” (gardener) when it was first exhibited in 1908 and he was later described as a farmer, peasant or harvester. Until now, efforts to identify him have failed. The unpublished note, in the documentation of the Musée Estrine in Saint-Rémy-de-Provence, records a statement by Louis Poulet, based on what he had been told by his grandfather François, who died in 1954. In Van Gogh’s time François Poulet had served at the asylum as an orderly and carriage driver. He often accompanied the artist outside the walls to paint the Provençal landscape. 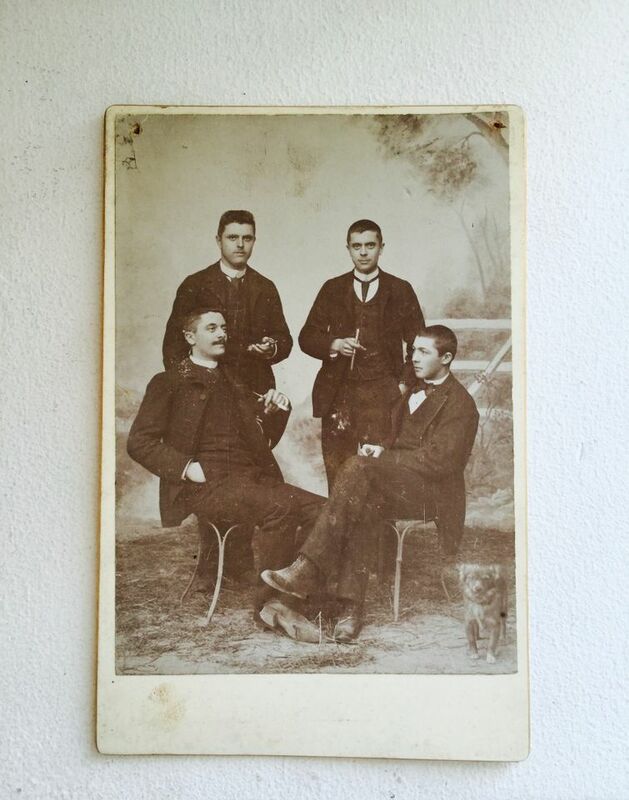 According to Louis’s note, his grandfather had told him that the portrait depicts “Jean Barral (1861-1942)”. This seems highly likely to be correct. Jean Barral was born on 21 January 1861. When he married in 1887 in Saint-Rémy-de-Provence he was described as a “cultivateur” (farmer) and at the birth of his daughter in 1890 he was “un journalier” (day-labourer). It is therefore quite possible that he worked in the gardens or fields of the asylum. He would have been aged 28 when the portrait was done, which accords with the figure in the painting. The Poulet family, who recorded his name, lived for generations just outside the asylum. Their note led me to track down Jean’s story. He was the son of Jean Pierre, a travelling basket-maker. The birth took place at 1 o’clock in the morning “on his cart” while in Eyragues, 6km north of Saint-Rémy-de-Provence. In the portrait Jean looks the epitome of youthful optimism, but tragedy was about to strike. On 10 May 1890 his wife had their first child, a girl called Adeline, who died just five days later. The death occurred the day before Van Gogh’s departure from the asylum, so the artist may never have learned about the traumatic loss suffered by his friend. The portrait was stolen from Rome’s Galleria Nazionale d’Arte Moderna e Contemporanea by gunmen in 1998, but it was recovered by the Carabinieri art squad a few weeks later, hidden wrapped up in a blanket underneath a bed in a nearby apartment. It is currently on loan to the Fondation Van Gogh in Arles for the exhibition Hot Sun, Late Sun: Untamed Modernism (until 28 October). Barbara Tomassi, the curator at the Rome museum, responded earlier this week to our new information on the sitter in their portrait, describing it as “truly interesting and innovative”. Although she needs to study the evidence, she says the identification of Barral is “plausible and susceptible to further research”. The full text of the handwritten note, which is written next to an image of the painting, reads “Louis Poulet, rapportant un propos de son grand-père, François Poulet, qui fut garde-malade à St-Paul, dit que ce serait de là le portrait de Jean Barral (1861-1942)”. The note, by an unidentified researcher, is in a collection of 1980s papers. Other notes in this collection suggest that the researcher was well informed and meticulous. Martin Bailey is the author of Starry Night: Van Gogh at the Asylum, published by White Lion (available through Amazon in the UK and US). He is a leading Van Gogh specialist and investigative reporter for The Art Newspaper. Bailey has curated Van Gogh exhibitions at the Barbican Art Gallery and Compton Verney/National Gallery of Scotland; he is now co-curating Tate Britain’s The EY Exhibition: Van Gogh and Britain, opening in March 2019. He has written a number of other bestselling books, most recently The Sunflowers are Mine: The Story of Van Gogh's Masterpiece (Frances Lincoln 2013, available in the UK and US) and Studio of the South: Van Gogh in Provence (Frances Lincoln 2016, available in the UKand US). Read more from Martin's Adventures with Van Gogh blog here.